Product prices and availability are accurate as of 2019-04-20 11:20:56 EDT and are subject to change. Any price and availability information displayed on http://www.amazon.com/ at the time of purchase will apply to the purchase of this product. 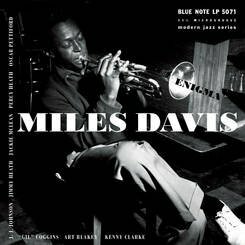 Four previously unreleased Miles Davis performances from the Blue Note vault, recorded 1952-1953, presented on a standard black 10" disc in the same style as Miles' original Blue Note 10" discs. Track List: "Enigma (Take 2)", "Kelo (Take 1)", "Chance It (Take 3), "Chance It (Second Alternate) (Take 4)"